I know this is a long-overdue post about something absolutely wonderful and intense that I feel so lucky to have been a part of. Last July, myself and some other WWW’s got to go to NYC to meet with the Writer’s Guild East. The Guild is a bunch of amazingly talented, successful and professional playwrights, novelists, TV writers, and more. November 2011 was our time for the second trip of the retreat. The purpose was to have our mentors look at our writing we had done during the few months in between the retreats and give us some constructive feedback on our writing. It was a great experience. I am working on my memoirs or “momoirs” as my son calls them. As many of you can imagine, to write about something very profound and life changing can be like opening Pandora’s Box of emotions. I have not had the time or the privacy to sit and blubber like a fool while I type a bunch of stuff out. I know I need to do it, I will do it. I will just have to make sure I hit up the local Costco for tissues. Have you ever experienced something and stuffed all of your emotions away just so you could put out the fires life throws at you and so you can be strong for your kiddos? That is what I did. Just when I thought I had the lock tightly closed and hatch sealed, I found out during our trip we were going to visit Ground Zero. Ground Zero is the area of New York City in which the Twin Towers once were. This is the hallowed ground of 9/11. 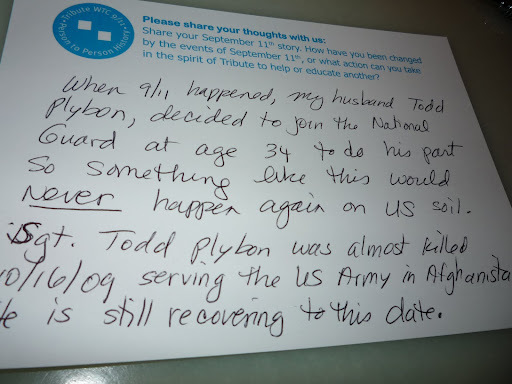 Anyone that knows my husband Todd, knows that it was 9/11 that inspired him to join the National Guard before he was too old to do it. 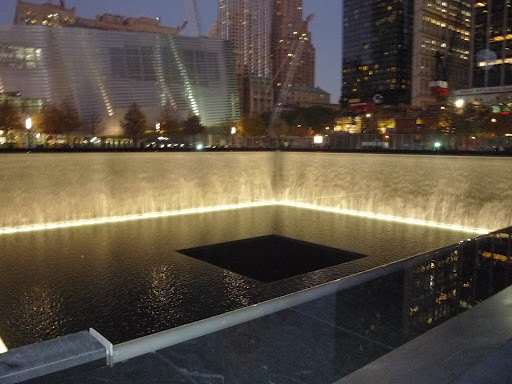 My mind was spinning at the thought of seeing a memorial to all of our innocent people lost on a brutal attack that many people, even New Yorkers, have forgotten about. The trip would put in front of me the most visually impacting symbols of loss and hope that I have ever seen. My husband is forever suffering from serving his country. Wounds that are both visible to the eye, and invisible. The invisible wounds are the worst ones. It was a beautiful day in November, 2011 when we all got off of the bus and walked to Ground Zero and waited in line to get in. 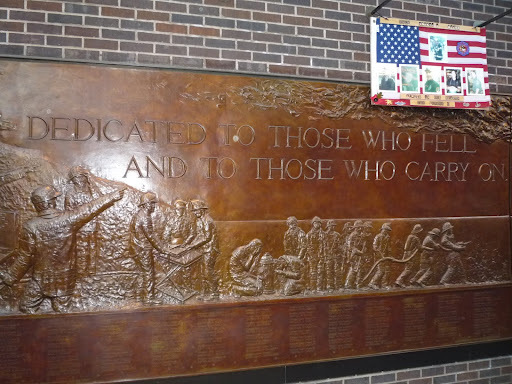 On the outside, there is a beautiful bas relief in bronze of the firefighters who died trying to help rescue the people trapped in the rubble. That bronze sculpture above wrapped around a huge side of the firehouse. It made me cry when I saw all of the in memory of written on the plaque. So many people sacrificed themselves to help strangers. How many people sacrifice anything at all in their lives to help others? There were a bunch of tourists around from other countries. Some were standing in front of the wall laughing, cracking jokes and posing. I wanted to kick them hard. To me it was a solemn, beautiful thing to look at and give it respect. Not treat it like a Mickey Mouse statue at Disney World. 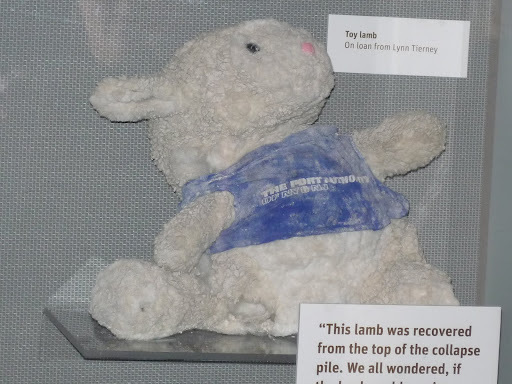 In the museum, there were items that were found in the rubble and excavation of the property to build the new memorial grounds that are breathtaking and very tactful. 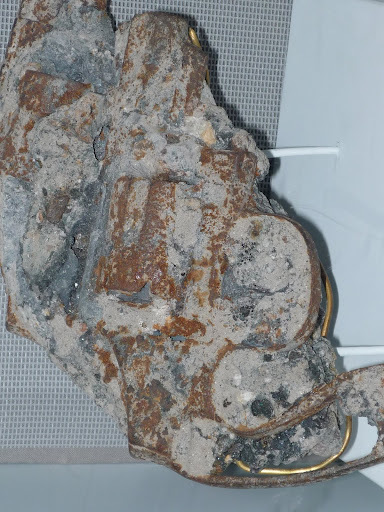 The item above was a .45 revolver that had melted into the cement during the blast. 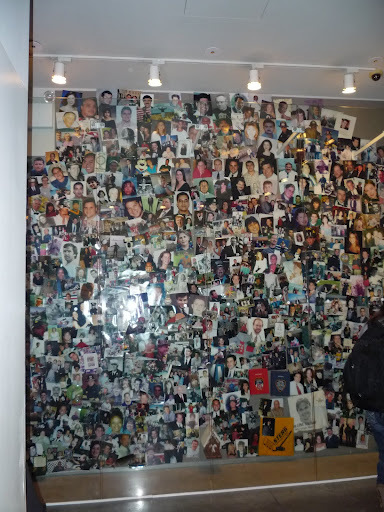 One of the things that made it surreal and heart breaking was the wall of pictures of the lost. The walls were tall- I am guessing around 20 feet tall and were covered every inch of pictures of people missing and lost. People to never be seen again. I thought of every family missing their loved ones and it made me glad. Glad that my husband decided to stand up and support his country. Never again did he want to see such horrors inflicted on US soil ever again, not if he could help it. The stuffed lamb really made me sad. I thought about a child dealing with the panic of what that day was like. 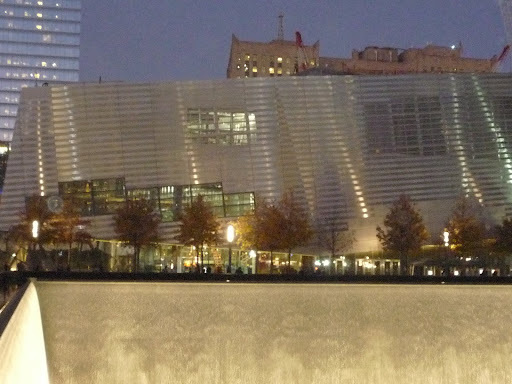 The museum had sound bytes from the 911 calls, to actual messages from victim’s cell phones. It sounded like pure chaos. The innocence that the animal portrays made me think about the parent that had to reconcile the fact that they were not going to live through the event. How can you hold your child’s hand in a tragedy and look into their eyes, knowing you are only going to see them again in heaven. This was my hand written dedication to the memorial. Visitors from everywhere wrote their kind words of healing, faith, encouragement, and support. I was blown away to see the kindness of others that poured in via these postcards of support. Some from South America, Africa, and the Middle East. It made me smile to see kindness. To see humanity. 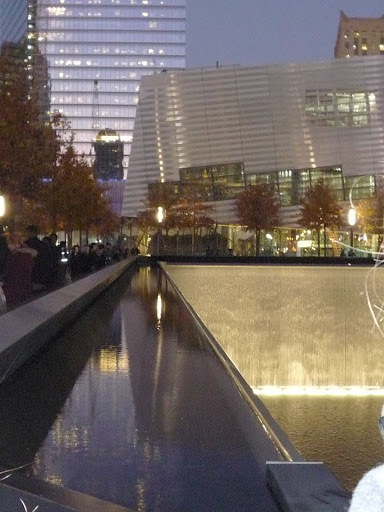 Outside, where the twin towers used to be are two beautiful giant granite and marble monuments with large water fountains in them. Here are the pictures of those. I took pictures of some of my friends, but I was crying my eyes out, looking at the symbols of my husband’s best times of his life and the worst. It was hard to see the reasons he went to war, right in front of me. I am so glad I did get to see it. I really felt that it was beautiful the way the people’s names are lit up along the sides of it. The names were the firemen. There were so many names. I am proud of my husband for serving his country at a time of crisis and I do not regret what he did. He will never regret not answering the feeling he had of patriotism to sacrifice his life and the life of his family for serving. I hope we never ever again see such a sickening loss of life on our soil ever again.